Ambetter individual and family healthcare coverage in Indiana provides affordable options in 28 counties. The parent company, Managed Health Services (MHS) has been providing quality medical coverage to Hoosier residents for 21 years. Marketplace policies can easily be purchased, and rates are often lower than other major carriers, such as UnitedHealthcare and Anthem Blue Cross and Blue Shield. MHS is a managed care provider that helps operate the Children’s Health Insurance Program (CHIP), Hoosier Healthwise, and Healthy Indiana. In addition to enrollment duties, they coordinate community events and provide public information about existing and future programs. The National Committee For Quality Assurance (NCQA) has awarded its “commendable” designation to MHS for outstanding services. MHS is actually a wholly-owned subsidiary of Centene Corporation, which is a Fortune 500 company specializing in providing services to government-funded programs for consumers that are without medical coverage. Some of these programs include Medicaid, Aged, Blind, or Disabled (ABD), and CHIP. Earn $20 on your My Health Pays card every month you visit the gym of your choice at least eight times. Get discounts on gym membership fees at approved locations. They’ve partnered with gyms and health clubs across the country. Just visit Ambetter.mhsindiana.com to find an eligible gym in your area. $500/$1,000 Integrated with medical ded. Integrated with medical ded. Integrated with medical ded. Integrated with medical ded. Integrated with medical ded. Integrated with medical ded. PCP Office Visit 20% after ded. $30 $30 $30 $20 $30 No charge after ded. Specialist Office Visit 20% after ded. $60 $60 $60 $40 $65 No charge after ded. Imaging(CT/PET Scans, MRIs) 20% after ded. 20% after ded. No charge after ded. No charge after ded. 20% after ded. 20% after ded. No charge after ded. X-rays & Diagnostic Imaging 20% after ded. 20% after ded. No charge after ded. No charge after ded. 20% after ded. 20% after ded. No charge after ded. Urgent Care 20% after ded. $100 $100 $100 $100 $75 No charge after ded. Emergency Room* $250 after ded. 20% after ded. No charge after ded. No charge after ded. 20% after ded. $400 after ded. No charge after ded. Emergency Transportation* 20% after ded. 20% after ded. No charge after ded. No charge after ded. 20% after ded. 20% after ded. No charge after ded. Inpatient Facility Fee 20% after ded. 20% after ded. No charge after ded. No charge after ded. 20% after ded. 20% after ded. No charge after ded. Inpatient Hospital Physician & Surgical Services 20% after ded. 20% after ded. No charge after ded. No charge after ded. 20% after ded. 20% after ded. No charge after ded. Outpatient Facility Fee 20% after ded. 20% after ded. No charge after ded. No charge after ded. 20% after ded. 20% after ded. No charge after ded. Outpatient Surgery Physician/Surgical Services 20% after ded. 20% after ded. No charge after ded. No charge after ded. 20% after ded. 20% after ded. No charge after ded. Labs & Diagnostics 20% after ded. 20% after ded. No charge after ded. No charge after ded. 20% after ded. 20% after ded. No charge after ded. Mental/Behavioral Health & Substance Use Disorder Outpatient Services 20% after ded. $30 $30 $30 $20 $30 No charge after ded. Rehabilitation Outpatient Services(Includes Speech, Occupational, Physical Therapy) 20% after ded. 20% after ded. No charge after ded. No charge after ded. 20% after ded. 20% after ded. No charge after ded. Skilled Nursing Facility 20% after ded. 20% after ded. No charge after ded. No charge after ded. 20% after ded. 20% after ded. No charge after ded. *If you require coverage for Pediatric Dental please shop on the Health Insurance Marketplace for a stand alone dental plan. **Dental Annual Maximum Benefit does not apply toward any other maximums. With offices in Indianapolis, Fort Wayne, and Merrillville, Ambetter offers low-cost healthcare throughout much of the state. The 28 participating counties are Adams, Allen, DeKalb, Elkhart, Huntington, Kosciusko, Marshall, St. Joseph, Wells, Whitley, Boone, Clarke, Daviess, Hamilton, Handcock, Harrison, Hendricks, Henry, Howard, Johnson, Knox, Lake, LaPorte, Madison, Marion, Miami, Montgomery, Porter, Pulaski, Steuben, Tippecanoe, and Vanderburgh. Network Providers The network provider list is quite extensive, and includes primary care physicians, specialists, Urgent-Care locations, hospitals, and many other medical and rehabilitation and treatment facilities. For example, if you lived in the Indianapolis area, the following hospitals would be considered “in-network.” We used a 40-mile radius. What About Doctors? The availability of primary care physicians (PCP) allows you to choose from many doctors within your area. Specialists, behavioral health, dental and vision options are also plentiful. We listed below the number of network PCPs in several large and small cities. After each city, shown is the number of providers within a 20-mile radius. Typically, the number of available providers increases each year. NOTE: A 24/7 nurse advice line is also available. Registered and licensed nurses can provide professional assistance to current policyholders. 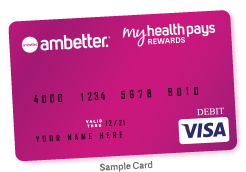 As an Ambetter member, you can earn reward dollars for taking charge of your health. Their My Health Pays™ program rewards you for completing healthy activities. You will receive your My Health Pays™ Visa® Prepaid Card when you earn your first reward. If you already have a My Health Pays™ Visa Prepaid Card, your reward dollars will be added to your existing card. They’ll automatically add any new rewards you earn to your My Health Pays™ Visa Prepaid Card. The more you do, the more reward dollars will be added to your card. It’s that simple! YOU CAN USE YOUR REWARDS TO HELP PAY FOR YOUR HEALTHCARE COSTS, SUCH AS: Your monthly premium payments Doctor copays* Deductibles Coinsurance *My Health Pays™ rewards cannot be used for pharmacy copays.